Other than grading there are several options for managing submission attempts. There are all accessible from the Grade Details page. Completely removes/deletes the submission attempt. Ignore the attempt’s score in grade calculations and do not count it against the maximum number of attempts. Only appears if the student has already submitted the maximum number of attempts allowed for that assignment. You can continue to offer opportunities to resubmit attempts each time the student reaches that maximum number. You do not have to grade previous attempts to allow a student to submit again. 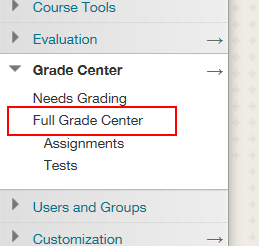 Browse to the Grade Centre. Roll over any Submission and open the context menu using the Downward Chevron. 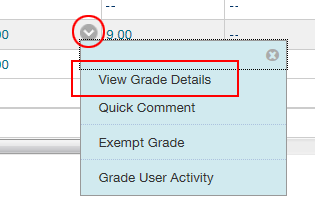 Select View Grade Details. From the Grade Details page select your preferred option.